Tom Devaney organized a celebration of George Oppen’s 100th birthday — and the event happened at the Writers House in April ’08. Soon after, we set up a special PennSound page with links to audio recordings of the presenters (myself included). Now we’ve released a PennSound podcast featuring a twenty-three-minute excerpt from that event. 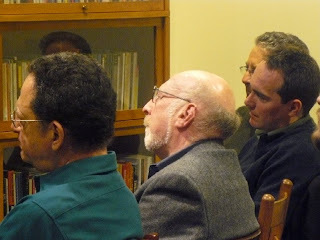 The photo was taken that night — George Economou, Michael Heller, Tom Devaney, and Tom Mandel, listening to Ron Silliman present on Oppen.